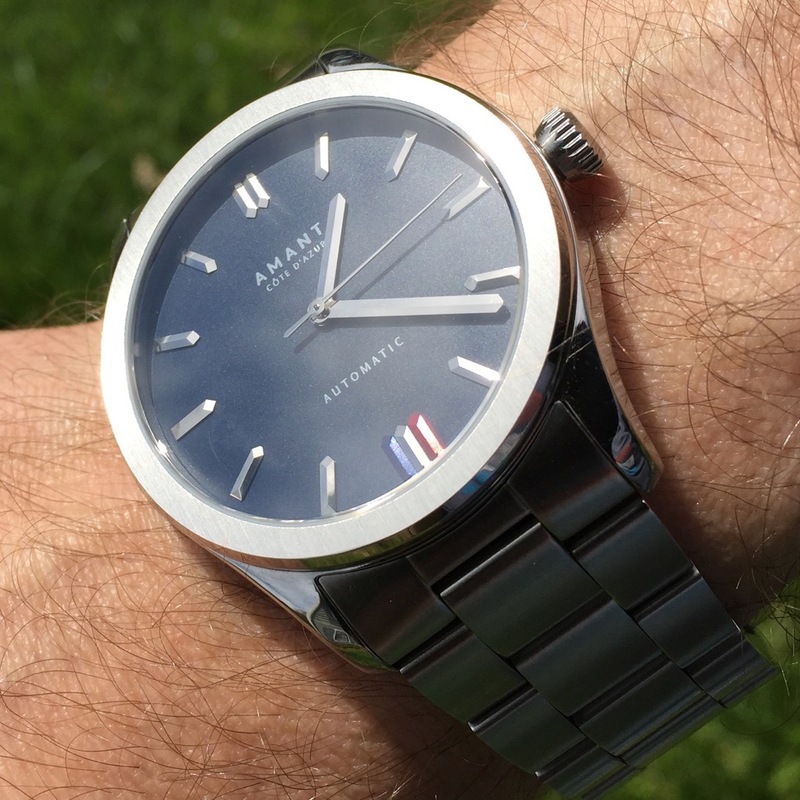 Amant are a worldly company, who previously made rather simple watches for more formal occasions. While they were nice enough, they didn’t really push any boundaries — using simple movements, plain designs, and handsome leather straps. Something has happened to them. Something has shaken them from this reverie, and they’re making something wonderful, but only if you back the kickstarter, can you get one. This is the Amant Côte d’Azur Automatic. I’m just going to say it now: Get one. The Amant Côte d’Azur is an interesting global traveler. The company is Swedish, Côte d’Azur is in France, and the movement is undeniably Swiss. All of these things are brilliant, and it shows through in the watch. When I have shown the watch to people, the first comment is, “French? Looks French,” and they’re not wrong. The dial has three indices at the 6 position, colored blue, silver, and red. This subtle tricolore is gorgeous to look at, and distinctively reminds you that this is something special. The indices are prisms, with their ends cut at a bevel, making them play in the light, reflecting off the many surfaces. Some might have placed the tricolore at the 12 position, where instead live two silver indices, but I think the south end of the dial was the right placement: it looks so nice there as it catches the light. The same is true for the hands, which are also prisms, and play in the light. The whole dial is difficult to photograph; at every angle, something is dark, something is light, something is reflective. While it’s a challenge to capture, on the wrist, it’s pure joy. It feels like bling, but it’s tasteful. The dial color is a deep matte blue that in some light looks black, and in others appears gray. The case of the watch has polished lugs, polished sides, and a bezel with polished sides and brushed top surface. The crystal is nearly flush with the bezel, and the bezel is brushed north to south, from 12 to 6. The crown is a screw-down crown (thank you!) and should make the watch water-resistant to around 200M. Amant have conservatively rated it to 100M. The bracelet has solid end links, but they’re machined to appear similarly to the folded metal end links of bracelets from years gone by. The oyster-style bracelet has brushed top surfaces and polished sides. The links are held with split pins, as opposed to machined screw links. The clasp is a simple stamped metal fold-over clasp with flip lock. The clasp is decorated with the etched AMANT logo. Honestly, the clasp and the split pins for link adjustment are the most out of place things on this watch. The excellent fit and finish, the solid end links, the beautiful dial, the nice tapered crown all show off high quality. Were the clasp a butterfly deployant style, it would look 10x better. The clasp, such as it is, has three positions for micro-adjustment. Where’s the downside here? As said, the clasp and split pins aren’t the best choices, although I can forgive it. The worst part of this is the poorly named Kickstarter project. “The Ultimate Explorer Watch – Swiss Automatic Diver” seems off. Here’s why: The watch isn’t a diver, being limited to 100M, no rotating diver bezel, and no diver’s extension in the bracelet. It isn’t the ultimate explorer’s watch, because it has no lume. This doesn’t bother me, and I’ll tell you why: I love this watch. I love the way it feels when I wear it. I love the tapered crown, and that it screws down. I love the indices and the way the light plays on their beveled surfaces. I enjoy the heck out of it, and my only regret is that I have to ship it back to Amant. The Amant Côte d’Azur is going for about $344 on Kickstarter early-bird pricing, and for an ETA-2824-2 movement with as nice execution as this watch has, it’s an excellent value. I want one. You should, too. Who we think it might be for: You like a classy watch that tastefully fits in the styling realm of AP or Nautilus, with a more traditional case shape and a non-integrated bracelet. Would I buy one for myself based on what I’ve seen? : Yes. Try and stop me.